Abstract integrator base-class; does not make any assumptions on how radiance is computed. In Mitsuba, the different rendering techniques are collectively referred to as integrators, since they perform integration over a high-dimensional space. Each integrator represents a specific approach for solving the light transport equation—usually favored in certain scenarios, but at the same time affected by its own set of intrinsic limitations. Therefore, it is important to carefully select an integrator based on user-specified accuracy requirements and properties of the scene to be rendered. This is the base class of all integrators; it does not make any assumptions on how radiance is computed, which allows for many different kinds of implementations ranging from software-based path tracing and Markov-Chain based techniques such as Metropolis Light Transport up to hardware-accelerated rasterization. This function can be called asynchronously to cancel a running render job. In this case, render() will quit with a return value of false. Configure the sample generator for use with this integrator. This function is called once after instantiation and can be used to inform the sampler implementation about specific sample requirements of this integrator. 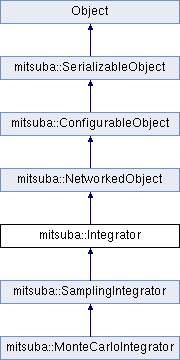 Reimplemented in mitsuba::MonteCarloIntegrator, and mitsuba::SamplingIntegrator. Possibly perform a post-process task. This function is called automatically before the main rendering process; the default implementation does nothing. Render the scene as seen by the default sensor. Progress is tracked by sending status messages to a provided render queue. The parameter job is required to discern multiple render jobs occurring in parallel. The last three parameters are resource IDs of the associated scene, sensor and sample generator, which have been made available to all local and remote workers. Returns true upon successful completion.